do my part in Congress to make sure they are supported. Following Judge Michael Simon's recent decision to require a full review of the Columbia and Snake River systems, there has been a movement to re-evaluate what our dams mean to Eastern Washington. Here in our region, the four lower Snake River dams provide renewable, reliable, affordable energy and act as a superhighway for barges to transport goods. As a community, we need to let our federal partners know that we want to continue to invest in and improve our dams. Currently, the Army Corps of Engineers is undertaking a public "scoping" period through Jan. 17 providing an opportunity for Eastern Washington residents to voice their support for dams and the benefits they offer to the region. I have long been a champion of our dams and the power they produce. I am the co-chair of the Northwest Energy Caucus and the founder of the Hydropower Caucus, which provide a platform for me to educate my colleagues in the House and Senate about the importance of dams and advocate for them. This year, I authored bipartisan legislation to streamline the dam relicensing process, which, if enacted, would lower electricity costs in Washington state. Currently, the four lower Snake River dams generate enough energy to power 1.87 million homes with clean, renewable hydropower. Nearly 70 percent of Washington's energy comes from hydropower, and dams are the reason our energy bills are so low. There are some who believe the Snake River dams are not allowing for adequate salmon recovery. However, thanks to collaboration between states, tribes, federal agencies and private property owners, our salmon are returning at record levels. Since 2014, more than 2.5 million adult salmon and steelhead passed Bonneville Dam, the highest returns since they began counting in 1938. The sockeye, fall chinook and coho were also among record and near-record runs as well. In fact, one of the biggest threats to fish is not the dams, but invasive predators. Many coalitions in support of our dams and fish have made serious efforts to remove invasive predators. To assist in their efforts, I support Rep. Jaime Herrera Beutler's legislation, the Endangered Salmon and Fisheries Predation Prevention Act. This legislation removes non-native California seals, which eat salmon as they enter the ocean or when they return to our rivers to spawn. The Snake River dams also allow for the efficient, cost-effective, low-carbon transport of goods. Nearly 10 percent of all U.S. wheat exports are shipped through the four lower Snake River dams. 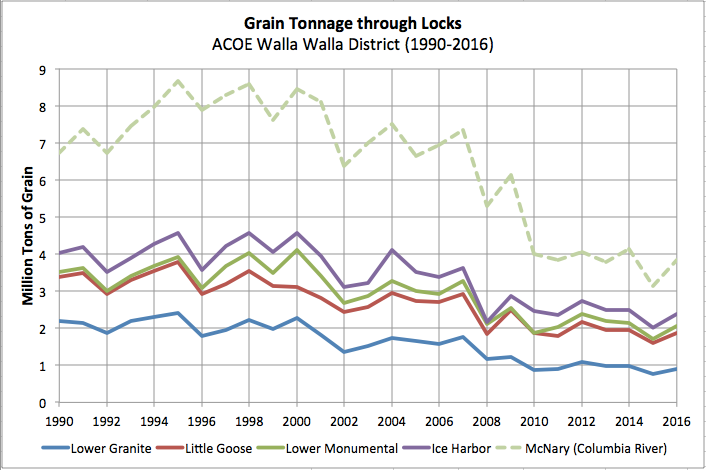 It would have taken more than 43,000 rail cars, or more than 160,000 semi-trucks, to move the goods that went by barge in 2014. Statista tells us that "In crop year 2016/17, the United States exported over 228 million metric tons of wheat." Lower Snake River's 2.5 million short tons represents 1% of wheat exports NOT 10% as Representative McMorris Rodgers claims. The shipping of goods throughout our system of locks and dams translates into jobs, and an estimated 40,000 port-related jobs exist in the Northwest thanks to our dams. That number is much higher when you take into account the jobs created and sustained by the entire Columbia and Snake River systems. I am proud to be a champion of our dams and the role they play in energy production, transportation, and trade. Everyone benefits from our dams, and I encourage everyone in Eastern Washington to voice your support. If you were unable to attend one of the scoping meetings held this fall, there is still time to submit written comments to the Army Corps of Engineers before the Jan. 17 deadline. Learn more about how to voice your support at www.crso.info/. Everyone benefits from our dams, and I will continue to do my part in Congress to make sure they are supported. Cathy McMorris Rodgers, represents Eastern Washington state in the U.S. House.